Hi everyone. 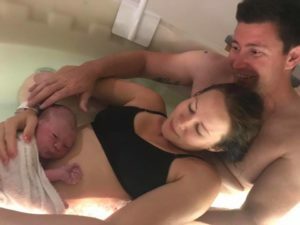 I’d love to introduce Noah born via a beautiful water birth at 38+5. I know I was loving reading detailed positive hypnobirthing stories in the lead up so thought I would share my experience if only to encourage at least 1 person to want to learn more. On Monday I started feeling a little “strange” I had a few Braxton hicks in the day and a little bit of cramping here and there but nothing consistent or painful. While on the phone to my mum at 6 pm my waters spontaneously broke. I got in the shower to clean up and started getting a backache so the water felt nice. Surges started maybe around 7:30-8pm and we watched some tv for a bit of distraction. At around 10:30 they started getting more intense so I put a towel on the floor in the shower to run water over my back and turned on the ‘Affirmations for beautiful birthing’ track when I suddenly threw up I knew it was time to go to the hospital. We arrived at the hospital around 11:30 pm and had 3 surges from the car to the birth suite where I immediately threw up again so I knew things were moving along. The midwife put me on the monitor while I sat on and then leant over a birthing ball. It took a little while to pick up a consistent read but once we had she then checked dilation. We had stated in our birth preferences that I did not want to be informed of my progress/dilation. I would highly recommend this as it was then impossible for it to mess with my head. The midwife asked if I’d like to get into the spa so I knew things were going well. While she filled the bath we went back in the shower and my husband ran the shower head all over my body while we put on the ‘prompts for birthing‘ track. I started feeling pressure and a soft urge to push. We moved to the birth pool and my breathing changed and I started bearing down while leaning over on the stair. I knew again we were moving in the right direction as the midwife was holding a mirror and shining a light down there during surges. The midwife was fantastic she only spoke in whispers and mostly communicated with my husband which is what we put in our birth preferences. She was familiar with hypnobirthing. It allowed me to stay in my positive mindset and do what I needed to do. The obstetrician arrived and my husband got in the pool sitting behind me supporting me as the surges intensified and I was bearing down and pushing with a lot more effort. When his head was born it was such a relieving and strange experience! Waiting for the next surge he was turning himself around! He was then delivered in one more surge and placed straight onto my belly (his cord was too short for chest). The cord was clamped and after a while when it stopped pulsing my husband cut the cord. I had also asked them to give me up to 30 minutes to deliver the placenta without injection. We moved to the bed and all went well and delivered the placenta successfully. I had a small tear that got stitched which was uncomfortable but I didn’t care I had my baby in my arms! One thing that we kept saying was he was sooo calm after birth and 2 days later that’s still the case. In terms of the resources with this course on the da,y we used the affirmations track and then played prompts for birthing over and over so many times haha. My husband used a lot of light touch, anchor touch, and a lot of positive reassuring that I was doing so well, every surge brings him closer etc. The different breathing techniques worked great as well. I couldn’t have wished for a more positive experience. Although it was so intense and there were times I was thinking in my mind I need to ask for pain relief the only thing I ever said out loud was I was struggling and just got on with it. I would just remind myself I must be in transition and it won’t be long before he’s here. It is possible to birth this way believe in yourself and your baby that you can do it.